If you’ve ever registered for a race, from a small local Turkey Trot to a large International Marathon, chances are you’ve spent some time on Active.com. When I visited active.com this morning they had more than 4,500 running races listed that you could register for, 1,950 triathlons and multi-sport races as well as more than 3,000 area parks and recreation activities. Just last week Active.com partnered with the folks at Sony in launching a new online community – bringing two powerhouses together under one roof, or at least one click of the mouse. The new Sony Walkman® online community will provide support for runners of all levels by providing a forum for runners to help each other prepare for their upcoming races, exclusive content from U.S. Olympic medalist and 2009 ING New York City Marathon Champion Meb Keflezighi and free co-branded Active.com Trainer plans for the first 5,000 participants. Pretty cool stuff, especially the shared training plans as I know that a lot of runners struggle with this aspect of preparing for a race. Having a trusted resource to rely on, keeping you on track and making sure you are avoiding the pitfalls of the “too much too soon” variety, is a great, great thing in my opinion. The new community will also be supported by Team Sony — a group of 120 amateur athletes and Sony Walkman ambassadors who have been carefully selected based on their passion for and involvement in endurance sports. 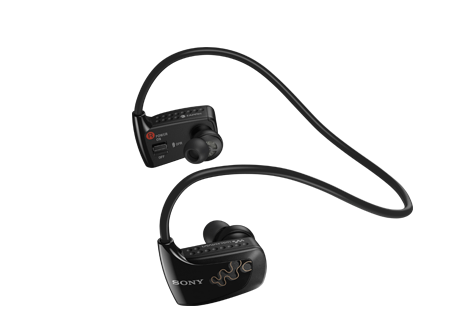 Team Sony ambassadors will use the new Walkman® W-Series MP3 player (NWZ-W262) in their own training and at select endurance events through January 2012. In addition, Team Sony members will be regular contributors to the Sony Walkman site, offering encouragement through video posts, photos, recommended workout soundtracks and more. Meb will offer tips and inspiration to the Sony Walkman online community as a regular content contributor and resource for training participants. Team Sony members will also be active in their communities using the Sony Walkman W-Series and discussing the benefits of its convenient wire-free, water-resistant and portable design that makes it even easier to train with their favorite tunes. Now if you are of my generation, it is hard to see the words Sony Walkman without thinking about the original cassette tape portable Walkman blasting out your favorites from REO Speedwagon or The Buggles. But let me tell you something, the new W-Series Walkman is something else entirely. The Sony Walkman W-Series MP3 player features a convenient lightweight, rinsable, wearable and water-resistant headphone-style design that is ideal for fitness enthusiasts. The official music player of the Rock ‘n’ Roll Marathon Series, the Walkman W-Series is designed to conveniently and comfortably accompany its user to the gym, trail and treadmill. The W-Series Walkman comes with Content Transfer software that allows users to easily drag and drop music files from iTunes® for Windows®, Windows Media Player or Windows Explorer and a quick charge function that gets 60 minutes of battery life from a three minute charge. The folks at Sony and Active have been kind enough to send a pair of W-Series Walkman systems to us here at Run for Dom. I will be testing one unit to do a full product review, while the other system is going to be given away to a lucky loyal reader in the next few weeks. Stay tuned for more details, I am currently dreaming up what the requirements for entry will be. With our participation in the Denver Rock ‘n’ Roll Half-Marathon coming up in just a few weeks, it would make sense for us to tie the contest to that event. Perhaps a “closest to Joe’s Half-Marathon Time” without going over will do it. Happy trails everyone! So glad to see another great online running community get its feet underneath it this week. After all, that’s what this whole thing is about. Bringing people together as we all chase down our goals and dreams. Who said running had to be an individual sport? 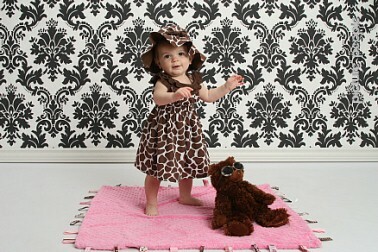 Happy 1st Birthday to Landry! Everyone told me to enjoy every minute with Landry when she was first born because before I knew it, I was going to look up one day and she would be in High School. I tried my best to listen to them. I took a month off last December when Landry’s Mom went back to work so I could stay home with the baby and help with the transition. We hung out every day. Sang songs, played together – I even taught her how to blow raspberries – which she still does all the time, only now she likes to do it with a mouthful of food. Dad learned from that one. 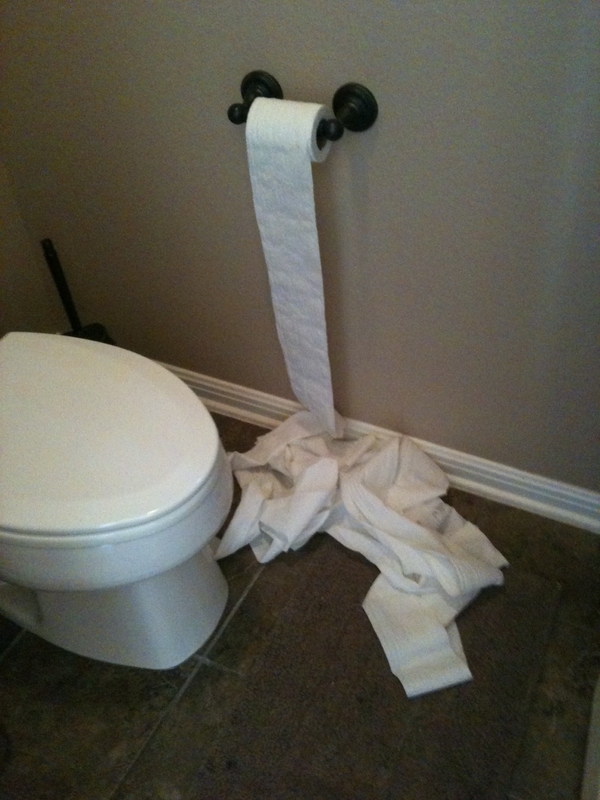 But when I got back to the house from my 20-mile run Sunday morning it really hit me. My daughter was going to turn 1 on Monday. I’ve known Dawn now for over 16 years. We have been married for 11 1/2. Lots of great times, trips, memories, laughs and some tears – but without a doubt, the best 11+ years of my life. Bt this last year, with all of the ups and downs, sadness as not one, not two, but three friends tragically lost their lives through accidents and illness, has been an amazing journey. I’m not sure that I was paying close enough attention to things over my first 43 years. At the time I’m sure that I thought I was. But truly, I was not. I wasn’t always taking time to notice the small things in life. Just feeling fortunate to see a sunrise or how a cool breeze coming off an ocean makes you feel. Those are life’s moments. Not everything that is important happens when the spotlight is shining brightest. In fact, maybe it’s teaching your daughter how to blow raspberries or sitting on the floor struggling with the most horribly designed assembly instructions EVER to put together a car for your daughter’s first birthday. 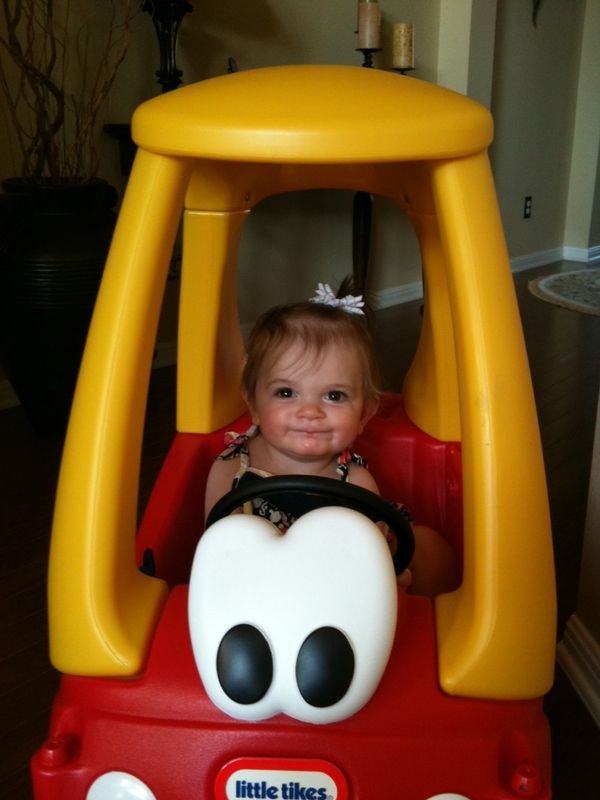 Just seeing her huge smile as she is being pushed around the house in her new car makes it all worth it. 20-mile training runs are great and everything. They are part of the price of admission for me to take on the NY Marathon in a couple of months. But all things considered, I think I’d rather be home trying to figure out which washer in the picture is “D” and which one is “V” and why there is no mention of which set of screws to use to attach the roof of the car, or why the small caps that hold on the wheels don’t seem to line up properly, what exactly that blue tab is and why is it included? Which hole does the stem for the steering wheel go, and why are there three of them? Does the floorboard go in front first or front last? Does the key assembly go in one piece at a time, or should you assemble it first …. why don’t they give any written instructions any more? Alas. It’s all good. Just part of the price of admission. The making of a marathoner …. Marathon training is a funny thing in that the preparation for the actual race can be very similar to the race itself. There are going to be miles where you feel invincible followed by others where you feel incredibly vulnerable. Moments when you feel like you cannot take another stride, followed by times when the miles seem to roll off your back effortlessly. There are going to be miles when you ask yourself rather seriously, “why am I doing this?” – only to be surprised moments later by a sunrise, a child holding a sign or the cresting of a hill when you know exactly why you are out there. You also know that this won’t be the last time you take on this challenge as it has come to define you in a way. It is all about the journey. It always has been, never about the destination. But especially during training for the race there will be one run that you can trace everything back to. One run where for the first time you feel like the training is coming together, that you are indeed going to take this thing to the limits of your capabilities and on Marathon Sunday – it is all going to come together for you. Saturday was that run for me on my way to NYC. The training schedule had an innocent number 9 in the box for Saturday. I am at the stage in the training plan where I run approximately 1/2 the distance of my Sunday long run the previous day. But I run those miles at an up-tempo pace. Hoping to bring the run in under 7:00 min./mile pace. But to really nail this workout it is not enough to just break through the 7:00 minute/mile barrier. I want to run a slow first mile to warm up and then continue to push the pace harder and harder as the run progresses, finishing with the final mile being my fastest. Closing strong on tired legs, pushing through discomfort but not succumbing to it. 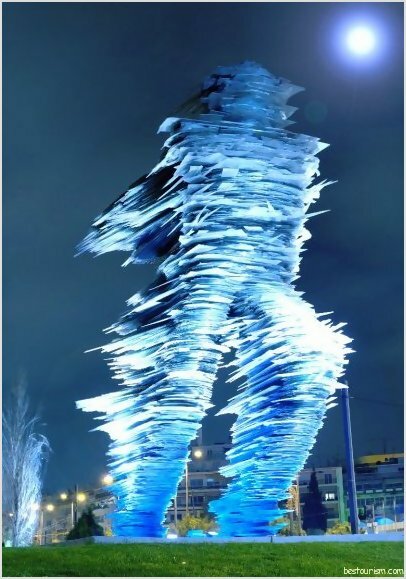 It is a run that tests the physical limits of where I am at that point in my training cycle, but also starts to sculpt the marathoner that I want to be on race day – mentally as well as physically. I like to envision myself as a rectangular block of building clay standing on end at the start of the marathon cycle. Each workout places the chisel, hammer, carving tool and brush against that building block and scrapes a little away. At the end of 18 weeks what is left is the marathoner. These Saturday runs are the runs that cut a little bit deeper. They remove more material than any other day of the week, giving me a glimpse of what my goals should be for race day and let me know what I am capable of when I toe the line among the thousands of other runners who have decided to go all in and take on the 26.2 mile course. These are the workouts that I take a peak behind the curtain to see where we are. Where we need to improve and how far away we are from being a finished product. Some mornings these workouts are humbling, other days they are inspiring. But they are always honest and always true. There is no hiding from up-tempo Saturdays. As I loaded a water bottle into my hydra-belt I knew it was going to be a tough day. Temperature was already 76 degrees at 5:45 a.m., no breeze and the humidity was hanging around at 70%. A pretty standard summer morning this year, but I was still struggling with this sinus cold/infection I have been dealing with all week. My flights on Friday were very difficult as the cabin pressure put a lot of force on my sinus cavities. Excruciating pain up, down, up and down making my way back home to Austin. I am having trouble breathing through my nose and had a restless sleep on Friday night. I decided to stick to the schedule and give it my best shot. After an opening warm-up mile in 7:27 I started to wind the watch a bit and let my legs settle in to a more comfortable pace posting miles 2 and 3 in a pair of identical 7:08’s. With 6 miles left it was time to go: 6:58, 6:46, 6:51, 6:57, 6:44, 6:43. Despite the temperature rising with the sun on my back and the sinus discomfort I was able to set all that aside for 1 hour, 2 minutes and 44 seconds to close out the run feeling like I had another 5-6 miles at that pace in me. It was just one run. One of eighty-nine on the way to the Staten Island Ferry on November 6th, but it was the first run in this training cycle when I could feel the power in all the runs before it to this point. The tempo runs, hill repeats, marathon pace runs and long runs are doing what they are supposed to be doing. Each one removing just a bit more material. Smoothing out an edge here, carving a line there, molding me into the runner that along with all the other hopefuls in NYC looks to be the best they have ever been at the largest marathon on the continent. I still haven’t settled on a time goal for NY, we’ll leave that for the flight home from the Denver Rock and Roll Half-Marathon one month before NYC. After that race I should know down to the minute what I feel I am capable of in New York if the weather cooperates. But this Saturday confirmed for me that no matter what, we’ll be looking to PR at New York. It’s not a matter of if, only of by how much. One of the things that I find so interesting about the marathon is that even though the race is “the same” from a distance perspective, each marathon is anything but. They all have their own set of challenges to overcome not only during the 26.2 mile test from start to finish, but during the training and preparation that leads up to the event. Whether it is training through an injury, overcoming poor weather conditions, multiple long runs in the heat or the freezing cold. Rainy training days, high winds or even preparing for a race course that is very different than anything you can simulate in your home town. Preparing for the Boston Marathon in Austin, TX is a bit more challenging than it would be if I lived in Brookline or Chestnut Hill, MA. That is just part of the deal, and what makes the marathon such a unique event. Especially if you are racing at one of the majors that involve a trip to another city. With NYC approaching in now just a little over 10 weeks, I have started to focus some of my key workouts each week, specific to he challenges that the NYC Course will present. The marathon course in NY while not flat like say Houston or Chicago, is much “flatter” than Austin or Boston. But the NYC Course does feature some climbing – late in the race through Central Park over the final 10 kilometers as well as the various bridges that the course covers while visiting the five boroughs along the route. This week my travels took me to Charleston, SC where the topography is nothing like NYC or Austin for that matter. But Charleston does have one thing that Austin does not to help me for prepare for NYC and that is a large bridge. And I mean a LARGE Bridge. Wednesday morning’s 10 mile run at marathon pace took me through basically the entire historic district including a loop through the Citadel campus. I passed by the church yard where I had my first kiss with Dawn, the Exchange Building where we had our wedding reception in 1999, the bed and breakfast where we spent our wedding night, the High Batter and Rainbow Row. It was a wonderful trip down memory lane, and a great 10-mile pace workout on a very hot and humid morning. Thursday however was time to take on the Cooper River Bridge for a up-tempo 8-miler. My goal was to traverse the long spanning Bridge from downtown Charleston over to Mount Pleasant and back keeping my pace even and steady, pushing hard on the inclines and easing off the gas to recover on the downstroke. Basically practicing what I hope to do in NYC crossing the Verazzano, Queensboro and Manhattan Bridges – staying smooth and even with my mile splits as we cross river after river. Crossing over the Cooper River this morning before sunup was wonderful, save the 94% humidity that greeted me as I started my 8-miler. 7:19, 7:14, 7:17, 7:22, 7:17, 7:15, 7:15 and a final mile at 7:00 flat. People often ask me if it is tough to train while I am on the road. The fact of the matter is that aside from packing a couple extra pairs of running shoes with me, my water belt and some extra socks and shorts, it really isn’t. In fact, I try to make the most of it and incorporate any local “advantages” that I can into my workout, specific to my upcoming race. Whether it is running at elevation out in Denver, which I will be doing at the Rock and Roll half Marathon just 4 weeks before NYC, or getting in some bridge work out in the Carolinas, you can always find a way to push a little harder and prepare just a little bit better than you could if you were just staying home or even worse, cautiously heading to the hotel gym and running on the treadmill. There is a big world out there for the distance runner to explore. Take advantage of it. There is always another hill to crest right around the corner if you look hard enough for it. It seems like every training cycle there is something there to make what is already a daunting 18-week minefield even tougher to navigate. Whether it is the standard aches and pains that go along with preparing for a marathon, a difficult travel schedule that makes your workouts tough to get in, an actual training injury, difficult weather or becoming a new parent, it seems like there is always something to complicate things. 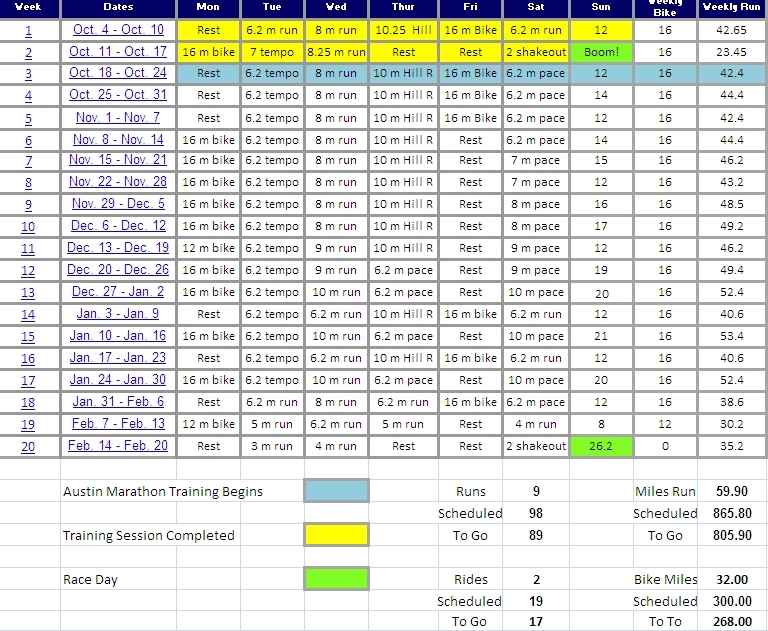 With the NYC Marathon now just 76 days away, I have had a pretty easy go of it thus far. Sure on Wednesday this summer will officially become the hottest in Austin’s history – just three more 100 degree days stand in our way to that dubious distinction – but from a health and injury standpoint, it’s been smooth sailing. But just when you think that things are going great, is when Lady Marathon humbles you. This time in the form of a virus I picked up either traveling last week, or from little Miss Landry’s school. Either way, my usually reliable breathing apparatus is down for the count. Sore throat, stuffed up nose, poor sleep as every hour or so my nose is completely blocked and I am unable to breathe normally. I can only imagine the logs I am sawing when I do fall asleep, to Dawn, I apologize. But with 27 miles on the schedule this weekend, just now reaching the meat and potatoes portion of the training plan, you can’t just mail it in and hope for the best. Saturday’s 9 mile run at Marathon Pace followed by Sunday’s 18 mile long run came at a key point in the training cycle. This is the point where we will run 1/2 as far as our Sunday Long Run on Saturday at Marathon Race Pace. Followed up by a slower, steady state long run on tired legs that stretch 18, 19, 20, 21 and 22 miles. Then after a couple of race weekends at the IBM Uptown Classic and the Denver Rock and Roll Half-Marathon we will run our final 21 miler before tapering for NYC. This is the “dues paying” portion of our training calendar. Tempo Tuesdays, Mid-Week Long Runs, Hill Repeat Thursdays, Saturday Pace runs and Sunday long runs. That is the formula to get us to NYC in the best shape of our life as we try to drop another PR on the marathon November 6th. So out the door we went on Saturday throwing down a 9-miler at 7:15 min./mile pace, then an 18.3 mile long run in 2:26:13 on Sunday. Which begs the question I get asked a lot, especially in the winter months when it seems many runners are fighting colds. Is it o.k. 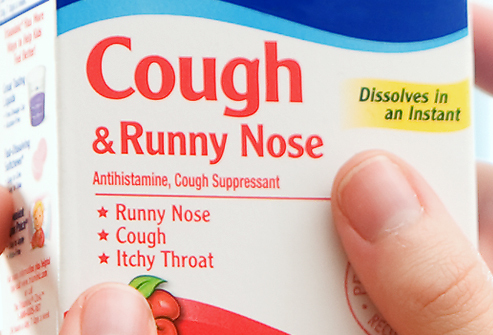 to run while I am sick? However if your symptoms are “Below the Neck”, things like a chest cold, bronchial infection, body ache – then rest is what is in order. If you push yourself while experiencing these types of problems, you could be asking for big trouble down the line. I am a big believer in the “Neck Rule”, if I am just fighting through cold-like symptoms, I dial back the intensity just a bit, about :10-:15 seconds a mile and go through my standard workout. Whatever is scheduled. The only thing I add to the neck rule is a quick check of my temperature. Your temperature while you are running commonly increases a couple of degrees while you are out there. That is not an issue when you are starting at or near 98.6. But if you are leaving the house with an elevated temperature, again, you could be asking for trouble. 99 or so, not a big deal, but if you are anything above just a slight temperature, it simply isn’t worth it and you are better served taking the day off or moving around your rest days that week to get some extra rest. Today was supposed to be a strength training day. We’ll be skipping that and simply taking a complete rest day, hoping to get this congestion under control so we are ready for Tuesday’s Hill Repeat session as we will be out of town this Thursday. We’ll be out in Charleston, SC where the steepest hill won’t quite get it done in the Low Country of South Carolina, so we’ll mix things up a bit and flip-flop our Tuesday and Thursday workouts. As runners we are very regimented. We hate to miss workouts, hate to stray from our schedule, but sometimes situations dictate that we become a little more flexible and train “Smart” instead of always training “Hard”. 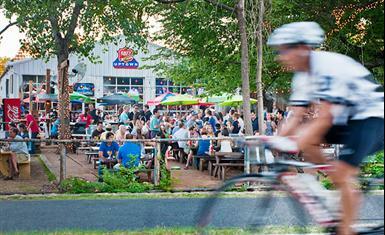 Katy Trail & Katy Trail Ice House – Is this Dallas or Austin? If you have been following along over the past year and a half or so at Run for Dom there are a few things that haven’t changed. We are still running and racing – a lot. And we are still traveling – a lot. Many of those cities on the list I have run in numerous times. I’m fairly certain I’ve forgotten a few. Some of those locations have been tremendous discoveries for me, running along old train lines, trolley tracks, canyons, bridges, trail systems, urban streets, downtown parks, hills, flats, oceans and coast lines. Through all of that, closing in on 4,000 miles since we started Run for Dom I have always felt like Austin was home, and nothing was quite like it. The streets, hills and trails here are just simply unique. Every run is different as Spring becomes Summer and Fall becomes Winter. The people are just a little different, dedicated to “Keeping Austin Wierd” and all that – but there truly is a community “Vibe” that you experience running in Austin that is comforting and genuine – that we’re all in it together here in Austin. While I was in Dallas this week I had an opportunity to run on the very well known and well-loved Katy Trail. 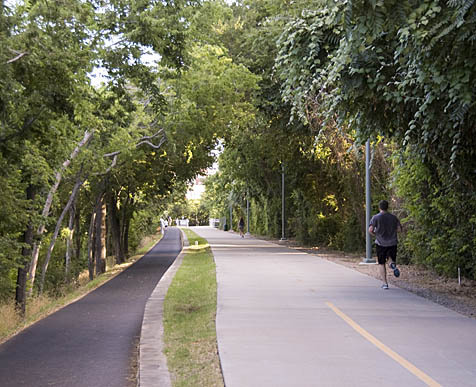 The Trail is an elevated 12 foot wide 3.5 mile long paved and lighted trail for cyclists, pedestrians, runners and a lot of lucky Dallas doggies. Adjacent to the paved trail is a 3.1 mile long pedestrian only trail that is essentially another 8 foot wide paved surface that has been covered with a rubberized impact reducing track like material. This side of the trail is for safety reasons restricted to only pedestrians. Mix in a fully lit trail when it is dark out, restricted access points to the trail and only two times where the trail actually crosses over an active roadway with vehicular traffic and you have a very popular exercise trail. Although the trail is short for half-marathoners and marathoners, the 7-mile round trip loop is great for quite a lot of runners. I was able to run my 8-mile tempo workout on Tuesday and with the help of a couple of miles off the trail to the SMU campus and back my 10-mile marathon pace workout on Wednesday. A great place to run in a very large bustling city like Dallas. But the real surprise for me was the Katy Trail Ice House that opened back on March 25th of this year. Literally a step off of the trail to the right heading from Victory Park up towards Airline around the 1.25 mile mark, there is a very “Austin-like” beer garden with heavy-duty picnic tables, misting fans and umbrella covered round tops to sit at and have a nice cold beer or beverage of your choice. The Katy Trail Ice House also has an indoor restaurant serving burgers in air-conditioned comfort with a nice bar and a few televisions to broadcast sporting events. My good friend Rob took a steamy 1.5 mile run from our hotel up to the Ice House after a day of meetings on Tuesday – my second run of the day – to enjoy the outdoor seating area and have a couple of adult sports elixirs. Afterall, carbs are carbs right? So if you are visiting Dallas and are either up near the SMU Campus area or down near the American Airlines arena, you are at a great starting point to the Katy Trail. A beautiful, scenic, low-impact running location where if you time it right, you can also visit a little bit of “Austin” without the 4 hour drive. I have a hard time wrapping my head around the fact that you passed away a year ago today. It seems like just yesterday we were sitting in your Mom’s kitchen enjoying the Seven Fish’s Christmas Eve Dinner and I was going back for my third serving of cavatelli and smelts. I gave my first ever baby bottle to little Nico – who sucked that thing dry in just a minute or two, showing me for the first time that it really doesn’t matter how much experience you have at some things when it comes to being a parent. Between you and the baby, the two of you just figure it out. All you have to do is love each other. The rest takes care of itself. Landry is now just two weeks shy of her first birthday, just a little younger than Nico was last summer when cancer took you away from us. Every day I am amazed at how much she has learned and how much she looks like her Mom. When I married Dawn I thought that I would never be in love with another girl for the rest of my life ….. 11 1/2 years later and I’m head over heels in love with our little girl. You were right about everything you told me about having a daughter Dom. She is the greatest. 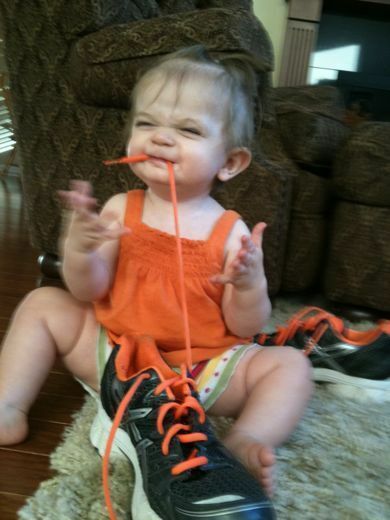 Sure she does some crazy things every now and then, and loves to chew on the shoe laces on my running shoes – but she’s ours and we adore her. I can only imagine how much Sierra and Nico miss their Daddy. A day still doesn’t go by that I don’t think about you Dom. I can’t pull on a pair of running shoes, look at an approaching race day on my calendar, hop in the pool or on the Tri-bike without thoughts of you and the strength that I am able to channel directly from you to put into my training. We had one hell of a last year Dom – lots of amazing races, filled with PR’s and a lot of hardware. 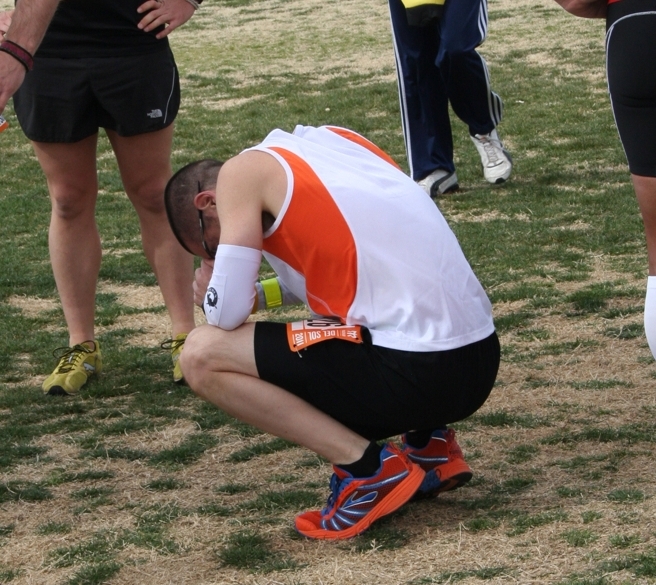 First place this, first place that, Age group win here, Masters win there – but all that stuff is just nonsense. You know it as well as I do. It’s not about winning ribbons and trophies Dom, it’s about taking advantage of the gift of that day. I want to know that I left absolutely every ounce that I had out there on that given day. A lot of runners and athletes are younger, stronger, faster and simply better than I am. I know that. But I’d like to think that I come closer than any of them of running to my potential on that day. That nobody pushes harder and gets the most out of their ability on that course, on that day, over that final mile than I do. You’ve given so many people so many things over the years Dom. That is just who you were. One of the most kind-hearted, generous and loyal people any of us have ever met. Your outlook and enthusiasm for life was truly contagious. One of the all-time great story-tellers, you packed more “living” into 39 years than most people will experience in 99. You “left it all out there” Dom in everything you did, that’s a lesson that no matter how much longer I’m training, running and racing, I promise I will never forget. All I have to do is look down and see your initials on my race flats and I can feel you right there with me, ready to do it one more time. 5K, 10K, 1/2 marathon, marathon – they’re all different, but in a way they’re all the same. Go as hard as you can as long as you can and leave no regrets. I learned that one from you Dom. Thanks for everything.